I follow numerous influencers on both Instagram and Youtube, but my feelings toward them aren’t entirely positive. This is a common sentiment, the root of which I want to explore and analyze here. I started following fashion bloggers before Instagram was a thing and when their main platforms were Blogpress or Tumblr. My mom thought it was weird and creepy because it was at a time when Facebook was still relatively new and cyber stalking was a scarier, and more mysterious threat. But I kept on reading anyway because I was fascinated by the ways different individuals dressed and at the same time, I suppose I felt like I could get to know someone who seemed like they lived in a totally different world from mine. Then Instagram came out when I was a freshman in high school, and more and more bloggers began to shift their main platform to the app as well as to Youtube. It made sense—they were platforms that fed on pictures and some form of words like Blogpress and Tumblr, but were more visual and out in the open in an increasingly visual and fast-paced world. With the growing popularity of the two platforms, fashion bloggers gained exponentially larger followings, which gave brands more incentive to give them clothes. They became consequential enough to be dubbed a new name—fashion influencers… and that brings us to where we are today. Though fashion influencers are essentially the fashion bloggers of today, my feelings toward them are a lot more complicated than what they used to be. I feel frustrated knowing that influencers get free clothes sent to them and receive countless other benefits. I can recognize two things that this frustration stems from. The first is the impression that these individuals are totally ordinary and what they’re doing does not seem all that difficult, yet are being rewarded for posting a few photos on Instagram or making a three minute video on Youtube. It’s a sentiment similar to that of people skeptical of modern art—they don’t think it’s fair that someone is getting paid for something that looks like they could have made. The second is the suspicion of sell-outs. The reason I decide to follow someone is because I find something uniquely appealing about that person. Yet, as influencers gain traction, they get more sponsors, and some inevitably sacrifice their individuality and authenticity for money and free things. I can't help but suspect every post they make and wonder if this person who I had originally followed for their unique sense of style had turned into a walking advertisement. I’m aware that these feelings stem from an overgeneralization of fashion influencers. There are some influencers that create content that is unique and obviously took a lot of time to make and there are also influencers—not being mutually exclusive—who only choose sponsors that they truly identify with. Sometimes I find that my feelings are totally validated though. For example, during a past internship for a fast fashion company, as I looked over Instagram posts of influencers who we had sent clothing to, I found one who had posted a photo wearing a gifted shirt and skirt exactly the way the company had styled it for their product page, passing it off as her own creation and style. I sighed, but moved on. A lot of this frustration is also the symptom of force breaking a habit. I'm not used to seeing so many ordinary people gain a level of stardom nor are we used to being surrounded by advertisements, particularly via the same ordinary people. It doesn’t feel fair. But, as two of the largest platforms today, Instagram and Youtube will inevitably become a space for ads and product placement, just as television was and still is. It’s something I have to come to accept. And if I really think about it, having ordinary people at the forefront of advertisements is also actually a great way to support individuals and celebrate each other instead of supporting even more questionable companies and corporations. This growing trend has turned advertisements into something much more uplifting and optimistic than what it used to be. The only real problem underlying all this is that followers don’t know when posts are sponsored because influencers often avoid disclosing unpleasant information. 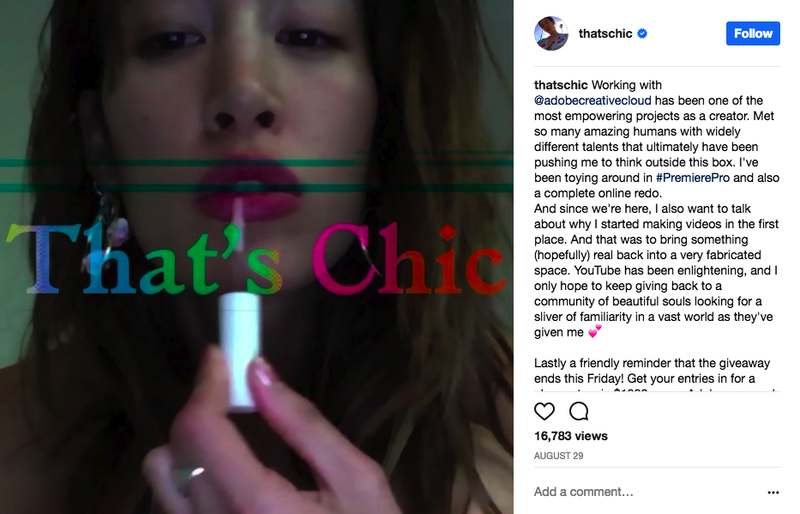 A few days ago, WWD published an article that discussed the unwillingness of fashion influencers and brands to disclose when they are posting sponsored content even after the Federal Trade Commission (FTC) began enforcing stricter rules. Quoted influencers stated that they avoided doing so because they were worried it reflected a lack of authenticity. Justifying themselves in this way shows a scary lack of self-awareness as they fail to realize that their unwillingness to disclose such information makes influencers more difficult to trust and more vulnerable to questions of authenticity. In a transitioning world, it’s necessary to accept influencers, but people can only do that happily if influencers accept who they are and what they are really doing, which is why I choose to follow influencers who appear honest, dedicated to their endeavors, and create unique content. Her Youtube vids have such a lovely mood to them and her style is the definition of effortless chic.